The colors I normally prefer to wear have really been embraced lately. Neon is in and I'm thoroughly thrilled about it. Not just neon...but the coupling of neon and bold colors. Maybe it's because I grew up watching Nickelodeon cartoons where my favorite characters were all outlined in black. Angry Beavers, Spongebob and now Family Guy. I love to laugh and I've had a lot of laughs watching or talking about those shows. My college roommate Nick and I really bonded over our love of cartoons. Oh...I'm getting nostalgic, let's talk about nail polish. How did I begin that cartoon-Sunday diatribe? Oh that's right...neon and bolds. 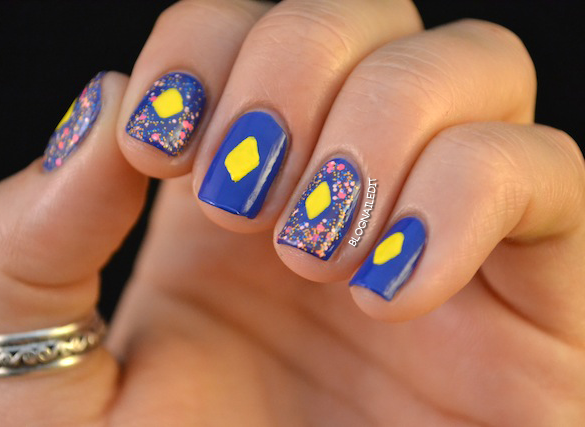 Check out today's manicure now! 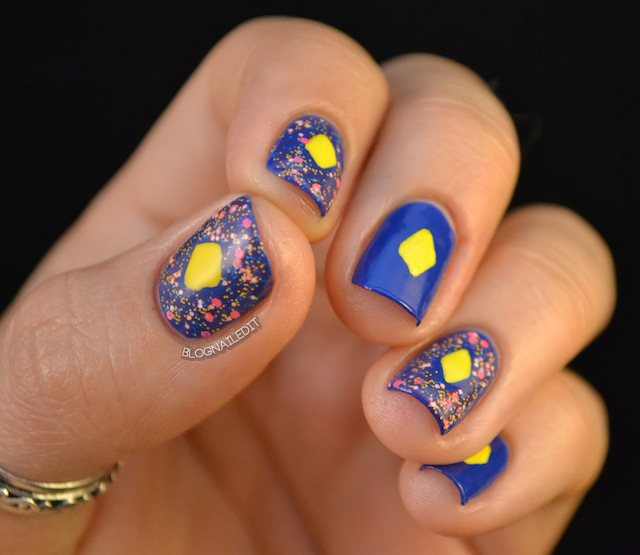 You've got a bright but dark blue base polish from Savina, Caribbean, a center diamond of Happy Go Lucky (China Glaze) and Summer Lovin' (Lush Lacquer) splattered on each nail. The consistency and size of the glitter in Summer Lovin' replicates a neon splatter doesn't it? I loved The Angry Beavers! *high five* I ttry now and then to spread the love to friends who didn't know the show existed. Summer Lovin' is so pretty - I love it! This looks so cute, I love all the polishes! I made a wish list of Lush Lacquer polishes yesterday and then made myself "narrow it down" to 6, and I literally just had to go double-check that Summer Lovin was in the top 6, because after seeing it on you I was like... well, if it's not in the top 6 I guess I'll just have to add it on and order 7. It was on there already, though. Thanks for making me EVEN MORE pumped about ordering from LL than I already was!